First lady Michelle Obama speaks in the East Room of the White House in Washington about a new part of her Reach Higher initiative. First Lady Michelle Obama launched a media campaign last week designed to help more young people go to college. A new social media website called Better Make Room is at the center of the campaign. Better Make Room targets young people aged 14 to 19. Obama calls this group “Generation Z.” The goal is to get the site’s audience to share pictures, stories and short videos about their experiences applying to college. The website will also supply information about college entrance exams, financial aid and visiting campuses. “I believe that education is the single-most important civil rights issue that we face today,” said Obama at a White House event in February. She hopes young people who use the site will feel supported by their shared experiences. She also wants people who seek education to receive the same support and respect as those who seek fame. Several famous people are showing their support for the campaign. Singer Ciara put a picture of herself at the White House on Twitter with the hashtag #BetterMakeRoom. 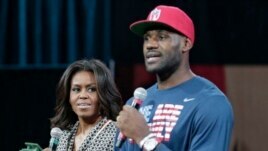 Basketball player Lebron James joined the First Lady at an event at the University of Akron last Wednesday. The event focused on the importance of education. "We don't come from places where families had a lot of money or a lot of resources," Obama told the crowd. "If we can be here, we know you can be here, too." Many organizations around the U.S. are also helping support the Better Make Room campaign. Websites such as Vine, Mashable, CollegeHumor and Funny or Die are some of Obama’s partners in the campaign. The television networks NBC Universal, The CW and A&E are partners as well. The campaign is part of Obama’s Reach Higher program. This program is the First Lady’s effort to get every student in the US to complete more education past high school. The effort includes sharing information about educational options, financial aid and academic planning. The Organization for Economic Cooperation and Development, or OECD, is an international economic organization of 34 countries. The OECD collects information from its members to study and fight the causes of poverty. Every year the organization releases a list of the college graduation rates of some member countries. In 2014, the graduation rate of the U.S. was lower than 18 of the 28 countries examined. In 1995, the U.S. had the highest college graduation rate of all OECD members. Bringing the U.S. graduation rate back to the highest in the world by 2020 was one of President Barack Obama’s earliest goals. He named this his “North Star” goal. The President has taken several actions to reach this goal during his time in office. In 2009 he created the American Opportunity Tax Credit. This decreased the taxes of families paying for college. In 2010 he called for all states to help make the first two years of community college free. Also, in 2013 he signed the Bipartisan Student Loan Certainty Act. This keeps the interest on student loans at a lower rate. The Obamas’ older daughter, Malia, will complete high school next year. Malia is still deciding which college she wants to attend. 下一篇：How Well Does Your Country Speak English?